The Encinitas City Council interrupted its summer recess for two short meetings recently to correct a clerical error in our Housing Element update. But the real action right now is on the political front. Some background: I’ve been a declared Mayoral candidate for months, and I’m happy to report that our campaign is off to a strong start. In a city with a campaign donation limit of $250 per person, as of June 30 we’d raised more than $20,000 from 130 individual people. This is great progress. Thank you so very much to all who contributed — your early donations demonstrate the support we have in the community! We’re now in the midst of the official one-month filing period, during which residents can file paperwork for Mayor or City Council, write their 200-word candidate statement, gather 20 signatures and pay the $750 fee to be on the ballot in November. Now this is where it gets interesting. In what the San Diego Union-Tribune called “a funny and familial turn,” the husband of current Mayor Kristin Gaspar announced that he’s now running for Mayor. Kristin is running for a higher office, which leaves the Mayor’s office open. Paul Gaspar, who has had limited involvement with local civic groups, commissions or committees, feels he’s just the person for Encinitas’ top job. Here’s my perspective — Paul Gaspar’s name recognition and reliance on his wife’s popularity could help him in this election. But beyond his lack of relevant experience in the civic fabric of the city, there are profound philosophical differences between Paul Gaspar and me. My focus on Encinitas’ environmental future distinguishes us. My commitment to protecting the city from inappropriate development distinguishes us. And our differences in temperament distinguish us. To me, being a successful Mayor means charting a clear, stable course forward in sometimes choppy seas. The city’s top problem solver needs a forward-leaning policy perspective as well as a steady, compassionate and productive disposition. Encinitas’ Mayor should be a pragmatist, a hard worker, a consensus-builder and someone who recognizes that Encinitas is great and we need to do everything we can to cherish and protect it. As your Mayor, I’m committed to open governance, to really hear people, to cultivate both self-discipline and a sense of urgency to tackle the issues at hand. Whether this Mayoral campaign is against three husbands of elected officials or none, I expect to work for, and earn, every single vote that we’ll get in November. Thank you for believing in my campaign to represent you as Mayor of Encinitas, and for helping me get there! 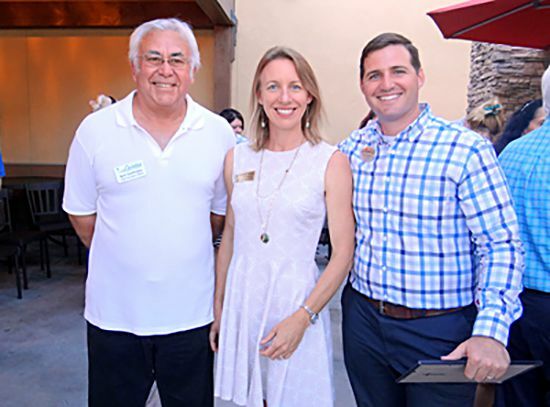 The Encinitas Chamber of Commerce held its monthly Sundowner at Chick-fil-A this month, and as usual, the restaurant was filled with many local business people. At left is Chamber CEO Bob Gattinella and right is Chick-fil-A owner Glenn Murdock. Some of these events will also include two candidates whom I support on the November ballot — City Council candidate Tony Kranz, running for re-election, and Tasha Boerner Horvath, a Planning Commissioner running for City Council. Events are being planned and added all the time. Please let me know by replying to this email if you’d like to host or co-host a Meet & Greet with your friends and neighbors!